Now on 45 RPM and Pressed at Pallas. Analogue Productions is proud to present the definitive album by Jimmy Rogers, one of the three founders of Muddy Water's first and greatest band, and a Chicago blues giant in his own right. Jimmy, whose evocative and earthy guitar sound embodies Chicago Blues, is recognized as a writer of Chicago blues songs second only to Willie Dixon and is regarded as one of the greatest Chicago blues singers by fans and musical legends alike, including Keith Richards of the Rolling Stones, who credits Jimmy as being one of his three greatest musical influences along with Muddy Waters and Chuck Berry. As the musical genre Jimmy pioneered is gaining mass popularity in the nineties, Jimmy's classic guitar work has been heard by millions in television commercials featuring songs such as Rock Me by Muddy Waters and I Ain't Superstitious by Howlin' Wolf. Jimmy is joined on this album by an all-star group comprised of the legendary pianist Johnnie Johnson, who was the backbone of all Chuck Berry's greatest hits, harmonica virtuoso Carey Bell, bassist Dave Myers, drummer Ted Harvey and lead guitarist Jimmy D. Lane. This recording won a W.C. Handy Award for the Best Traditional Blues Album in 1995. 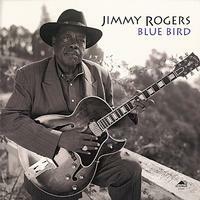 "Fans of Chicago blues aren't going to get any new recordings better than Jimmy Roger's Blue Bird... One of the reasons for the startling impact of this recording is the clear, resonant sound provided on both the LP and CD by Analogue Productions..."
"...this is a real 100% 1950s Chicago blues band and as can be expected the sounds they lay down are vintage and of the highest caliber. Finding a disc with such a pure and powerful Chicago blues on it in 1994 is a major revelation." "The finest-ever marriage of the blues and audiophile sonics, a bona fide blues session with sound quality, mastered by Doug Sax, never before associated with the genre. It's the most 'analogue-sounding' CD I've ever heard."